Sunday in Melbourne today is certainly different to last Sunday in Cairns. The temperature only got to 17c and it is freezing, a real wintery day. But it’s not winter till the end of this month. I actually love winter; to me it is a season that is cosy, warm PJ’s in front of the telly and the heater on. But I guess it is because I have had 2 ½ weeks of 28c – 30c hot humid weather that even though the heater was on I just couldn’t get warm. So I have spent the day unpacking, washing and looking at some of my T.V shows taped for me. I’m now watching the “Logies”, which for my non-Aussie friends; the Logies is the award show for our T.V industry. 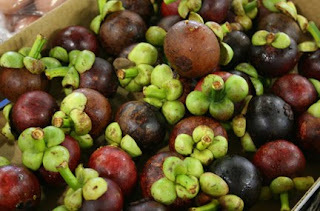 Mmmm I just love tropical fruit, wish we could get them in Melbourne. Mangosteen – I can’t describe what they taste like, except to me it’s the sweetest nicest fruit I have ever tasted. Custard Apple – This is also a really sweet fruit, but the texture wasn’t something I would jump to often. 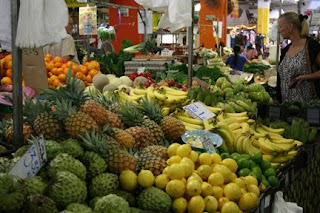 Rusty’s Markets is Cairns local fruit and vegie markets, open every Friday, Saturday and Sunday. The produce there was absolutely beautiful and all the stalls have tasting of all the fruits on their stands. So on Friday morning I arrived having not having had breakfast, so I did a typical backpacker thing to do and walked around the different stalls tasting. Mmmm such a lovely yummy fresh and healthy breakfast – very cheap too. "Davine Time" update: Curled up in front of the telly under a nice warm blanket. Isn't it cool to see the different things in our markets? I used to love tasting everything at a market, but now all I can think of is did they wash it? Did anybody cough on it? A case of ignorance is bliss for sure! I honestly have been out here reading your blogs from you wonderful adventure and loving every moment of the telling of it. Just not commenting much. Trying to save my hand. But it's feeling pretty good today and I just had to say. Wow. I am so envious of your lovely time for you. I also am so happy for you my friend. 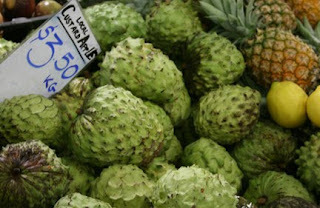 I love our farmers markets here but of course the exotic of yours is fabulous. As close to exotic that we would have here is pinon nuts and cactus fruit. The rest is pretty ordinary, but yummy. The fruit looks divine! I don't think that we can get some of it here but I'll have to make a note of that first one and check to see, sounds delicious! 17 degrees here is a warm day, now if you put a minus in front of that then it's getting chilly! How cold do your winters get? It seems odd that while you have winter we have summer. What is July like? That's what I'm aiming for next year! If we can dream something, we can do it... you show me that here time and time again Davine! Enjoy your show, take care and have a wonderful Monday! Yellowstone was very cold and wet today. I too am under a warm blanket listening to my roommate snore. We don't have a telly in the Park.